Get ready! 2018 entries open on September 15th! Contest Overview: This is a team competition for Salons based in the United States (including the District of Columbia). Employees/independent contractors/booth renters of/at a Salon (including commission salons, booth renter and salon suites, herein referred to as a "Salon") may create one or multiple "Teams" which include all of the following professionals who work at the Salon: Colorist, haircutter, hairstylist, makeup artist, and wardrobe stylist (one individual may cover multiple roles). Each Team will create a cut and/or color look and submit a photo of their created look to enter into one of five (5) competition categories. Select Teams will be invited to compete in the Finals for each category in New York City on June 25, 2017. The overall winning Team will be awarded a trip to Seville, Spain in October 2017 to participate in a global competition. 1. 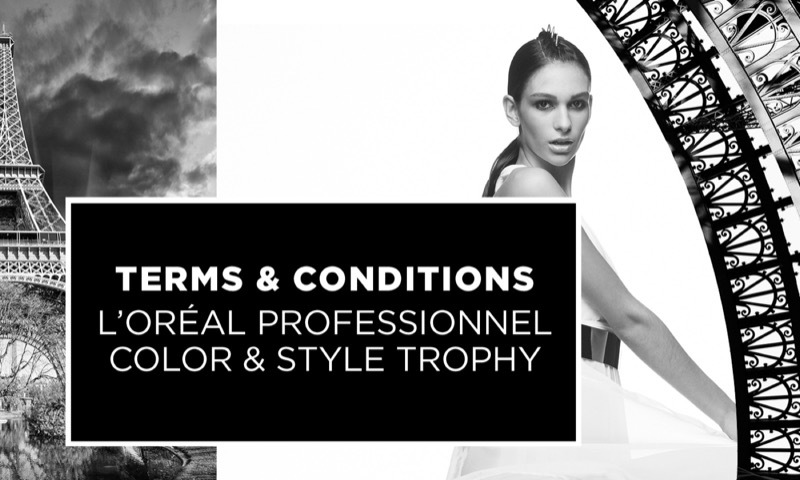 Eligibility: The L'Oréal Professionnel Color and Style Trophy Contest (the "Contest") is open only to professionals who are (1) legal residents of the fifty (50) United States (D.C.), (2) at least eighteen (18) years, (3) are employed by Salons that are located in and primarily operate in the fifty (50) United States and the District of Columbia old at the time of entry and (4) enter with the permission of their Salon. Employees of L'Oréal USA ("Sponsor"), its promotional agencies involved in this Contest, Judges of this Contest, and any of their parent and affiliate companies as well as the immediate family (spouse, parents, siblings and children) and household members of each such employee are not eligible. The Contest is subject to all applicable federal, state, and local laws and regulations and is void where prohibited. 2. Sponsor: L'Oréal USA, 10 Hudson Yards, New York, NY 10001. 3. Agreement to Official Rules : Participation in this Contest constitutes entrant's full and unconditional agreement to these Official Rules. Sponsor's decisions, which are final and binding in all matters related to this Contest. Winning the prize is contingent upon fulfilling all requirements set forth herein. 4. Timing: The Contest begins on February 1, 2017 at 12:00 a.m. Eastern Time ("ET"), ends on June 25, 2017 (the "Contest Period"), and consists of multiple phases as set for in the chart below. Sponsor's computer is the official time-keeping device for the Contest. 5. How to Enter: During the Photo Entry Phase one representative from the Salon (who has permission from the Salon to enter) must visit www.colorstyletrophy.com and follow the links and instructions to complete and submit the registration form, including information about your Salon, and the names and email addresses, and functional role (Colorist, Hairstylist, Haircutter, Make-up Artist, Wardrobe Stylist, or Model) of each Team member. Your Team must include a minimum of three (3) and a maximum of five (5) members who are employees of the Salon and one (1) model who is at least eighteen years of age. If your Team members are all between the ages of eighteen (18) - twenty-two (22), you may only compete in the Young Talent Competition. If your Team members are older than twenty-three (23) years old, your Team may elect to compete in any of the following competition categories (each a "Competition Category"): Color & Style, Color, Styling & Cutting, and Men's Image (requires a male model). Teams with members older than Twenty-three (23) may not enter the Young Talent Competition regardless of years of experience. NOTE: If a Judge is a member of your Salon, your Team may not enter the Competition Category for which he/she is judging. Once a Team is registered, all members must remain the same for the duration of the Contest (with the exception of the Model). Sponsor may deviate from this rule in the case of exceptional circumstances (such as death, disability or serious illness) as determined by Sponsor in its sole discretion. Create a head to toe fashion look on your model that includes a cutting edge hair style inspired by current fashion trends. Upload at least four (4) and no more than six (6) photos of the look you created. Recommended views are: front, back, right side, left side, full body, and top shot. Identify at least one Competition Category that your Team would like to compete in (you may compete in more categories depending on the age of the Team members). Your photos and completed registration form will be collectively referred to as your submission ("Submission"). Your Submission need not include any reference, positive or negative, to Sponsor's products or services. By uploading your Submission, you agree that it conforms to the guidelines, permissions, and content restrictions below and that Sponsor, in its sole discretion, may disqualify you if it believes that it fails to conform. Permissions : Team must have permission from owner/operator of the Salon to enter the promotion. · The Submission must not contain material that is unlawful, in violation of, or contrary to the laws or regulations in any state where Submission is created. Limit : Each Team may upload one (1) Submission for each Competition Category for which the Team is eligible during the Photo Entry Phase. A Salon may have multiple Teams participate; however they may not compete in the same Competition Categories. Submissions received from any person or email address in excess of the stated limit will be void. Submissions generated by script, macro or other automated means are void. In the event of a dispute as to any Submission, the authorized account holder of the email address used to register will be deemed to be the entrant and must comply with these Official Rules. The "authorized account holder" is the natural person assigned an email address by an Internet access provider, online service provider or other organization responsible for assigning email addresses for the domain associated with the submitted address. Each entrant may be required to show proof of being an authorized account holder. Released Parties (as defined in Section 11, below) are not responsible for lost, late, stolen, damaged, incomplete, invalid, un-intelligible, garbled, delayed, or misdirected Submissions; all of which will be void. 6. Sponsor's Use of Submissions: Uploading a Submission constitutes Salon and Team's consent to give Sponsor a royalty-free, irrevocable, perpetual, non-exclusive license to use, reproduce, modify, publish, create derivative works from, and display such submissions in whole or in part, on a worldwide basis, and to incorporate it into other works, in any form, media or technology now known or later developed, including for promotional or marketing purposes. If requested, Salon will sign any documentation that may be required for Sponsor or its designees to make use of the non-exclusive rights Team is granting to use the Submission. In the event of a tie, the judges will reevaluate scoring for each of the tied Teams' Submissions, prioritize the score for the "Complete Look" to determine the winner for the applicable Competition Category. Sponsor reserves the right to select fewer than twenty (20) Finalists per Competition Category, if, in its sole discretion, it does not receive a sufficient number of eligible and qualified Submissions. Sponsor will not disclose judging scores. Submissions of all selected Finalists will be posted on a gallery for public voting at www.colorstyletrophy.com. Any individual will be invited to vote for the Submission they believe has the most public appeal. Limit: Each person may vote one (1) time during the Voting Phase. Multiple votes received from any person or email address in excess of the stated number will be void. Any attempt by any Finalist or voter to obtain votes by any fraudulent or inappropriate means, including without limitation, offering prizes or other inducements to members of the public as determined by Sponsor in its sole discretion, by using any automated program, by using multiple/different email addresses, identities, registrations and logins, or any other methods, will void those votes for the Finalist's Submission and Finalist may be disqualified as determined by Sponsor in its sole discretion. Subject to the Finalist's compliance with these Official Rules, the Finalist whose Submission receives the highest number of valid votes during the Voting Phase will be deemed the potential People's Choice Award winner. In the event of a tie, the entrant whose Submission received the highest score during the Judging phase as determined by the qualified judges in their sole discretion, will be deemed the potential winner from amongst the tied Finalists. Sponsor reserves the right, in its sole discretion, to select an alternate winner should the voting appear to have been tampered with or manipulated in any way. 8. NYC Live Competition Requirements and Determination of Grand Prize Winner and Award Winners for each Competition Category: Each Finalist will be notified by Sponsor and provided with the details and requirements about the Live Competition, including judging criteria. All members of the Team (as described in the original online registration) must participate in the Live Competition to be considered. Each Team will be responsible for travel to and accommodations in New York as well as any other expenses associated with participation. The Teams will be asked to create the same look displayed in their photo Submission. Team members may be asked questions. To be considered to win an award for one of the Competition Categories or the Grand Prize, the team must be present and compete in the New York Live Competition. Judges will announce winner at the end of the Live Competition. There will be one (1) Grand Prize winner: the Team that scores highest within the Color and Style Competition Category. Winners in other Competition Categories will receive an award. 9. Requirements for Grand Prize Winner : Potential Grand prize winning Team will be notified at the NYC Live Competition. Each member of the potential Grand Prize winning Team (parent/legal guardian if a minor in his/her state of residence) will be required to sign and return a Declaration of Compliance, Liability Waiver and, where not prohibited, a Publicity Release ("Declaration"), which must be received by Sponsor within five (5) days of the Live Competition in order to claim his/her prize. If any member of the potential Grand prize winning Team fails to execute and return the Declaration within the required time period, does not comply with these Official Rules, or if prize is returned as undeliverable, the Team will forfeit the prize and an alternate Team (The team who received second place in the Color & Style Competition Category at the NYC Live Competition) will be offered the Grand Prize and will be required to complete the Declarations to accept the prize. Only two (2) alternate winners will be offered the Grand Prize, after which the prize will remain un-awarded. 10. Prize: ONE (1) GRAND PRIZE : Winning Team will be invited to attend the global competition in Seville, Spain that will take place in October 2017 (dates to be provided by Sponsor) as well as a photo shoot and interview with Team for Modern Salon Magazine. Trip package includes round trip, coach-class air transportation for each member of the Team (up to six (6) people) from a major airport near winner's home (determined by Sponsor in its sole discretion) to Seville, Spain; five (5) nights' accommodations at a hotel determined by Sponsor in its sole discretion (multiple rooms, each double occupancy); passes to L'Oréal Professionnel Business Forum; and ground transportation to and from destination airport and hotel; Team members must travel on the dates determined by Sponsor in its sole discretion or prize will be forfeited. Trip must be booked at least twenty-one (21) days prior to departure. Travel and accommodations are subject to availability. Travel must be round trip. Sponsor will determine airline and flight itinerary in its sole discretion. No refund or compensation will be made in the event of the cancellation or delay of any flight. Travel is subject to the terms and conditions set forth in this Contest, and those set forth by the Sponsor's airline carrier of choice as detailed in the passenger ticket contract. All expenses and incidental travel costs not expressly stated in the package description above, including but not limited to, ground transportation, meals, incidentals, gratuities, passenger tariffs or duties, airline fees, surcharges, airport fees, service charges or facility charges, personal charges at lodging, security fees, taxes or other expenses are the responsibility solely of winner. Each Team member is solely responsible for obtaining valid passports and any other documents necessary for international travel. Travel restrictions, conditions and limitations may apply. Sponsor will not replace any lost, mutilated, or stolen tickets, travel vouchers or certificates. Sponsor is not responsible if Global Competition or L'Oréal Professionnel Business Forum are delayed, postponed or cancelled for any reason, in which event that portion of prize is forfeited in its entirety and no substitution will be provided except as in Sponsor's sole discretion. Approximate Retail Value of prize for each Team Member is $7,500. Actual value may vary based on airfare fluctuations and distance between departure and destination. Winner will not receive difference between actual and approximate retail value. Prize is non-transferable (only Team Members who registered and entered may travel to Seville, Spain) and no substitution will be made except as provided herein at the Sponsor's sole discretion. Sponsor reserves the right to substitute the prize (or a component thereof) for one of equal or greater value if the designated prize should become unavailable for any reason. Each Team member is responsible for all taxes and fees associated with prize receipt and/or use. 11. Release: By participating in the NYC Live Competition and/or accepting any prize, each Team agrees to release and hold harmless the Sponsor, its promotional agencies, and their respective parent companies, subsidiaries, affiliates, suppliers, distributors, advertising/promotion agencies, and prize suppliers, and each of their respective parent companies and each such company's officers, directors, employees and agents (collectively, the "Released Parties") from and against any claim or cause of action, including, but not limited to, personal injury, death, or damage to or loss of property, arising out of participation in the Contest or receipt or use or misuse of any prize, including any related travel. 12. Publicity Acceptance of any prize shall constitute and signify winning Team and each member's agreement and consent that Sponsor and its designees may use the winner's name, city, state, likeness, photos, Submission, and/or prize information in connection with the Contest for promotional, advertising or other purposes, worldwide, in any and all media now known or hereafter devised, including the Internet, without limitation and without further payment, notification, permission or other consideration, except where prohibited by law. 13. General Conditions: Sponsor reserves the right to cancel, suspend and/or modify the Contest, or any part of it, if any fraud, technical failures, human error or any other factor impairs the integrity or proper functioning of the Contest, as determined by Sponsor in its sole discretion. If terminated, Sponsor may, in its sole discretion, determine the winners from among all non-suspect, eligible Submissions received up to time of such action using the judging procedure outlined above. Sponsor, in its sole discretion, reserves the right to disqualify any individual it finds to be tampering with the Submission process or the operation of the Contest or to be acting in violation of the Official Rules of this or any other promotion or in an unsportsmanlike or disruptive manner and void all associated Submissions. Any attempt by any person to deliberately undermine the legitimate operation of the Contest may be a violation of criminal and civil law, and, should such an attempt be made, Sponsor reserves the right to seek damages and other remedies (including attorneys' fees) from any such person to the fullest extent permitted by law. Sponsor's failure to enforce any term of these Official Rules shall not constitute a waiver of that provision. 14. Limitations of Liability: Released Parties are not responsible for: (1) any incorrect or inaccurate information, whether caused by entrant, printing, typographical or other errors or by any of the equipment or programming associated with or utilized in the Contest; (2) technical failures of any kind, including, but not limited to malfunctions, interruptions, or disconnections in phone lines or network hardware or software; (3) unauthorized human intervention in any part of the Submission process or the Contest; (4) printing, typographical, technical, computer, network or human error which may occur in the administration of the Contest, the uploading, the processing or judging of Submissions or votes or the tabulating of votes, the announcement of the prizes or in any Contest-related materials ; (5) late, lost, undeliverable, damaged or stolen mail; or (6) any injury or damage to persons or property which may be caused, directly or indirectly, in whole or in part, from entrant's participation in the Contest or receipt or use or misuse of any prize (including any travel/activity related thereto). Released Parties are not responsible for misdirected or undeliverable Submissions or for any technical problems, malfunctions of computer systems, servers, providers, hardware/software, lost or unavailable network connections or failed, incomplete, garbled or delayed computer transmission or any combination thereof. Released Parties are not responsible for any unauthorized third-party use of any Submission. Except where prohibited, each entrant agrees that: (1) any and all disputes, claims and causes of action arising out of or connected with this Contest or any prize awarded shall be resolved individually, without resort to any form of class action, and exclusively by the United States District Court for the Eastern District of Michigan (Southern Division) or the appropriate Michigan State Court located in Oakland County, Michigan; (2) any and all claims, judgments and awards shall be limited to actual out-of-pocket costs incurred, including costs associated with entering this Contest, but in no event attorneys' fees; and (3) under no circumstances will entrant be permitted to obtain awards for, and entrant hereby waives all rights to claim, indirect, punitive, incidental and consequential damages and any other damages, other than for actual out-of-pocket expenses, and any and all rights to have damages multiplied or otherwise increased. All issues and questions concerning the construction, validity, interpretation and enforceability of these Official Rules, or the rights and obligations of the entrant and Sponsor in connection with the Contest, shall be governed by, and construed in accordance with, the laws of the State of Michigan without giving effect to any choice of law or conflict of law rules (whether of the State of Michigan or any other jurisdiction), which would cause the application of the laws of any jurisdiction other than the State of Michigan. 17. Winner List: Winners will be announced at the Live New York Competition and will be posted on the promotional website.